The Holy Grail of location recording is the ability to isolate the sound of a source from that of the space in which it was recorded. Have Zynaptiq found it? 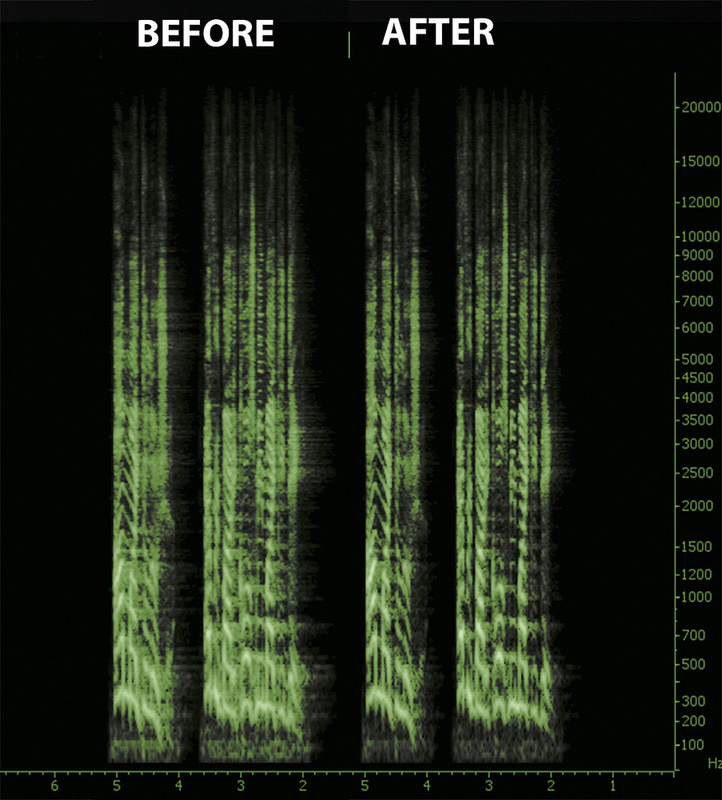 Since the dawn of recorded sound, one achievement has eluded audio engineers: the ability to effectively reduce unwanted reverberation present in recordings. Whether it be dialogue recorded in large reflective spaces, microphones too distant from sources or the over-enthusiastic application of artificial reverb during mixing, it has been extremely difficult, if not impossible, to turn reverb off once it has been captured with a mic or added to a mix. Various applications over the years have allowed engineers to go part of the way towards that end, with differing results. 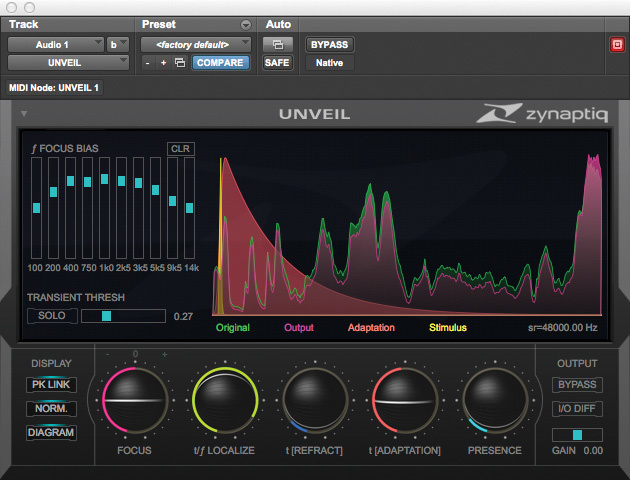 Now Zynaptiq claim to have finally solved the problem with Unveil, a complex plug-in designed to attenuate or boost the amount of reverb in recorded sound, whether the recording be of dialogue, solo vocals, instruments or mixes. Unveil ships as a plug-in for Mac and PC and as a stand-alone application for Mac. As of version 1.5, it supports Audio Units, VST, RTAS and AAX formats. There's more to Unveil, though, than just dropping it on a track and pressing a magic button. Before delving into its intricacies, it's worth considering what reverberation is. Perhaps because we are used to being able to apply it artificially, we often tend to think of reverb as being a singular entity. We add it, we take it away, we boost it, we lower it. Reverberation is really the result of a complex combination of factors: the shape and distance of surfaces, the acoustic properties of their materials, and so on. Unless you're sitting in an anechoic chamber (a room designed to be free of reflections), sound will bounce off the surfaces and be reflected back to the source. The reflections arrive back at the source at different times and amplitudes, but are generally too closely spaced to be perceived as individual echoes. Instead, they blend together perceptually in a way which defines for the listener the unique acoustic character of the physical space, and which gradually decays over time as the reflections progressively lose energy. When we look at Unveil, then, we need to consider what it has to deal with, and our expectations need to reasonable in accordance with the task at hand. Is our aim to remove all traces of reverb, or just some of it? Technically, Unveil brings a fresh approach to the problem, not relying on gate/expanders, de-noising or phase-cancellation methods. Instead, it uses a "pattern recognition and proprietary de-mixing engine” to separate the reverb component — or 'background' signal — from the foreground component. It can operate in mono, stereo, or up to eight-channel surround if your CPU can handle the load. It is designed, in theory, to affect only those sounds that "do not appear to contribute a significant amount of information to the signal”. Zynaptiq's documentation wisely says "reduce” rather than "remove”, and this it can accomplish to varying degrees, depending on what you throw at it. 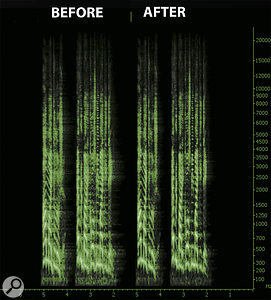 This spectrogram shows the same dialogue file before (left) and after (right) processing with Unveil. Unveil has a refreshingly unique interface that adds a few new items to your plug-in vocabulary. Thankfully, hovering the mouse over a control will reveal a small tool-tips window to explain the relevant operation. The most important, and the first, of a series of five spherical controls is labelled Focus. In essence, this controls the degree of reduction or boost in the amount of reverberation present in the signal. Higher values, towards the right side, remove reverb, while lower values attenuate the direct sound and increase the level of reverberation. Zynaptiq recommend having this set at its maximum when adjusting other parameters, so that the changes are more obvious, then backing it off until you achieve the effect you want. If you're having trouble getting Unveil to 'lock in' on the reverberant sound, there is a bank of 10 sliders just above the Focus control labelled Focus Bias. These allow for more direct, frequency-specific targeting of the effect: set the Focus control to the centre so that the signal is unprocessed, and move the sliders to exaggerate or ignore frequency ranges where the reverb is more or less prominent. Additional control parameters allow further refinement of the algorithm. To simplify, t/ƒ Localize helps manage 'pumping' artifacts or high-frequency oscillations, while t/ƒ Refract determines how much time the algorithm takes before reacting — the longer the time, the better the sound but the greater the chance of reverb slipping through — and t/ƒ Adaptation is used to tailor the analysis to match the release time of the reverb tail. Finally, the Presence control is used to restore lost high-frequency content. The Transient Threshold switch allows the user to specify that some transients should remain unprocessed, which can help retain impact. I/O Diff lets you audition a volume-compensated difference between the input and output signals, so you can hear what Unveil is 'throwing away', while the large display represents this difference visually, along with a representation of the Adaptation setting. I prepared a number of scenarios for testing Unveil: an on-camera interview recorded in a large garage with very reflective surfaces; an interview recorded using a camera-mounted mic; a mix with an absurd amount of artificial reverb applied to vocals and instruments; and a drum loop with too much live room sound mixed in. Film and television location sound recording has been one area, in particular, that has been in need of an effective tool to reduce excessive reverberation. Both of my tests with dialogue were extreme examples of typical problems faced in location sound recording, and Unveil did a pretty good job of reducing excess reverberation in both scenarios. It also had a tendency to remove background environmental sound ("room tone”), though, and further tweaking was required to find the right balance. Anyone with experience in restoration knows that you often need to use more than one tool, and in this case using a tool such as CEDAR's DNS or Spectral Repair in conjunction with Unveil can yield a more satisfying result than pushing Unveil too hard on its own. When using Unveil on a mix, there are a lot more variables to contend with, but I was able to reduce reverberation to make the mix sound more acceptable. It was necessary to employ a lighter touch in this situation. The drum loop was a little harder to work with than I anticipated. Finding the best balance between reducing reverb and preserving the transients on the hi-hat and ride cymbals took a little longer than expected. Taking the time to tweak the Focus Bias sliders made the difference. Unveil is pretty effective at doing more than just reducing reverb. It's also relatively good at removing 'mud' from recordings, and even at separating the reverb signal from the direct recording, which could be useful for up-mixing or game sound states. Unveil can boost or reduce high-frequency 'grit' in recordings, and match reverb amounts across different dialogue takes, and you can use it to move background sounds into and out of focus, to better match camera perspective. Overall, Unveil is a worthy addition to any post-production sound kit and is unique in its ability to isolate reverb from the foreground signal, but it requires some understanding and practice to use properly. To that end, it comes supplied with a number of presets for specific situations that serve as good starting points. It's pretty CPU-intensive, and will no doubt stress all but the most powerful systems. In film and television applications, it may be more effective to adapt a strategy where users treat individual clips and print the results, rather than leaving it live on a multiple tracks and automating the parameters. High buffer settings in your DAW are a must! The point at which Unveil appears to remove all reverb is the point at which the source starts to sound unnatural, lifeless and sometimes beset with processing artifacts, depending on the signal. Overdoing it with Unveil may produce results not unlike the improper use of noise-reduction software, and it's not all that difficult to make something sound worse than when you started — but sensible application, especially in conjunction with other tools, can yield exceptional results. My only worry is that once film and television directors discover how it can bail them out, best recording practices may be abandoned on location and we'll have even worse audio to contend with! Very effective at isolating reverb for manipulation. Has some useful creative applications in addition to its main function. Easy-to-use interface with helpful visual feedback. Can take to time to master. Over-use can produce obvious artifacts and lead to sterile-sounding material. Zynaptiq Unveil is a solid weapon for film and television engineers to employ against poorly recorded location sound. The fact that it goes beyond that is a bonus. Spending time learning to use it properly should yield gratifying results.